Perthshire is a county rich in legends and mythology and a comprehensive survey of every neuk and cranny in the area’s abundant supernatural heritage has now been explored in a new book called ‘The Guide To Mysterious Perthshire’ by award winning historical writer Geoff Holder. Everything from kirkyards to standing stones, from gargoyles to archaeological sites, from tales of witches and fairies to yarns of ghosts and weird climatic changes has been investigated for the edification of the armchair sleuth or the more adventurous on-the-spot explorer. Complete with details of where to go for further information and map references, this comprehensive guide is rich in many fascinating facts. Here is just a brief sample of its strange findings. 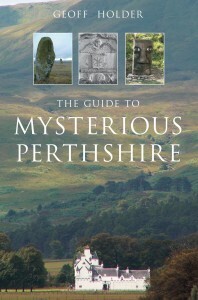 (‘The Guide To Mysterious Perthshire’ by Geoff Holder is published by Tempus, price £14.99). Some time before the Reformation, a very large bell was on its way to Perth for installation in St John’s Kirk. Unfortunately, the men unloading it at Friarton Pier dropped the bell into the water where it quickly sank down to the muddy bottom of the deep Friarton Hole. Many years later, a diver tried to recover it. At the very earliest this must have been in the late 17th century, the period which saw the first successful if haphazard diving contraptions being put into operation. The diver returned to the surface empty handed but terrified. He claimed he had seen the devil and his wife using the bell as a pot for making porridge. There is no record of the bell being disturbed thereafter, so presumably it is still down there being used as a hellish kitchen utensil. One of the cairns on the west side of a road near Balnabroich in the Glenshee area is the grave of a troublemaking mermaid killed by the Celtic hero Fingal’s pet hound Bran. He had chased her from her home in Loch Mharaich (or the Loch of the Mermaid) before fiercely and fearlessly attacking her on the open road. Pursuing the canine connection, during a hunt in 1317, Robert the Bruce’s favourite hound disappeared down a deep hole on the moors of Pitcarmick; and a week later emerged from a cave at Craighall, emaciated and wounded, but alive. *View more reviews for this book using the page navigation below.